Price HKD 110 for a set meal that includes soup, main and coffee or tea. Food rating Very good. Simple, light fare that is tasty. HK Magazine’s restaurant review gave it a 4-star rating (out of 5). The chef was previously a volunteer at World Peace Cafe. The veggie soups are great, not thick like the puree most western restaurants serve and not watery like most Chinese soups. Green rating Quite green. Vegetarian. Organic. Location Eastern Street, Western District, near Second Street. Call 2559 9098. 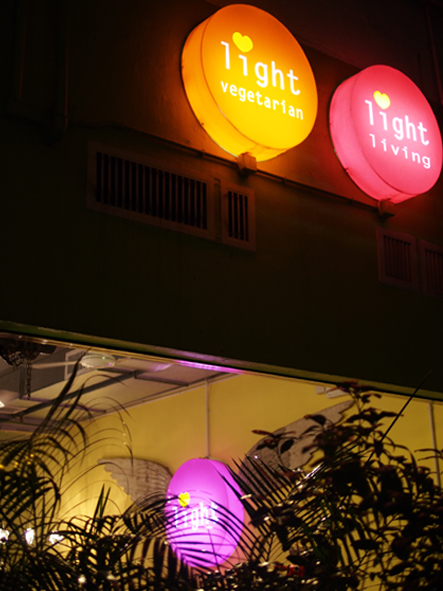 A vegetarian friend highly recommended the hamburger at Light to us, so we decided to drop by and give it a try. The cafe is located on the steep slope of Eastern Street. It is separated from the busy road by several large planters placed at the entrance. After we were seated, the waiter presented us with the menu which was written on a small blackboard. 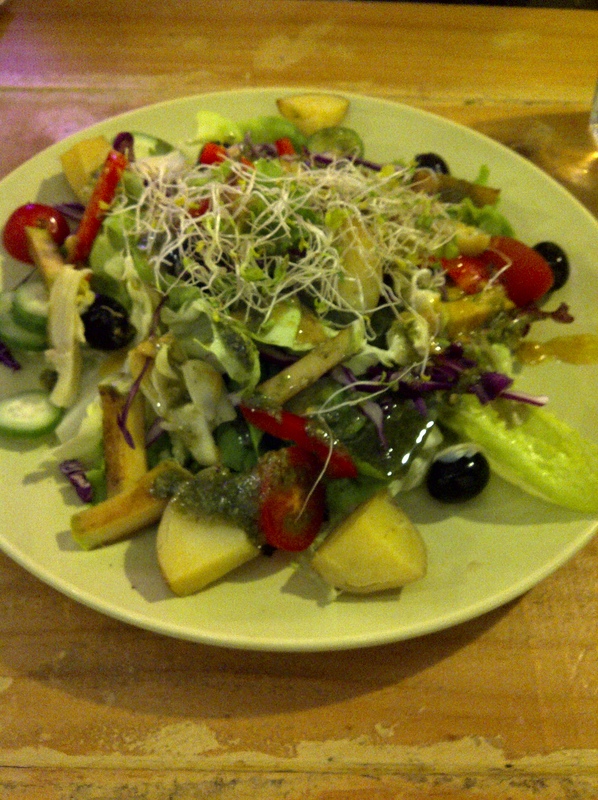 The salad we ordered was very colorful and made from a selection of quality ingredients, such as artichoke and olives. The main dressing is a little sweet and slightly sour. Pesto which is a little salty is also used, giving the salad an interesting mix of flavors. It also had some cubed potatoes making it just right if you’d like to order a salad but are concerned you won’t be full after. 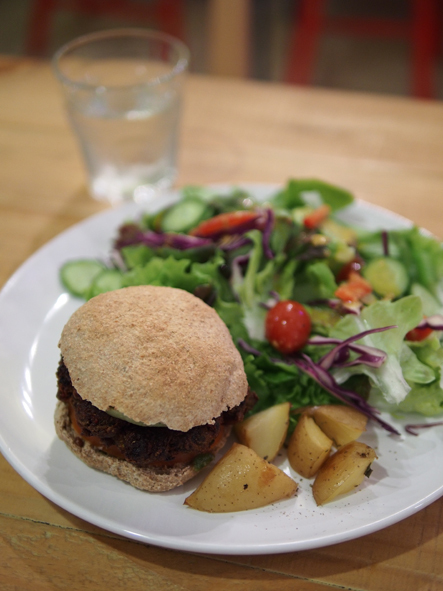 The black bean burger tasted much better than it looked. The bun is made of whole wheat and has a hard crust like country bread. The patty is spiced with cumin and reminded me of a falafel. The whole thing comes together in a very satisfying package. 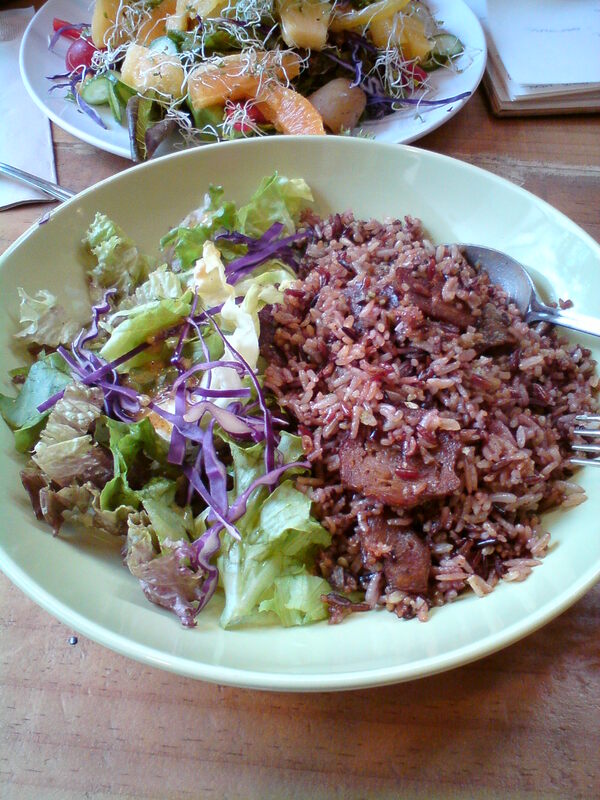 The fried rice is made of red and brown rice and homemade vegetarian sausage. The sausage was quite good, especially since I haven’t eaten one in quite a while. Although it was highly recommended by the waiter, we found the flavor a little too salty and presentation a somewhat dull. A great place for a Light meal. i find that most vegetarian/vegan restaurants seem to be quite pricey though, would you know of any that are not so pricey? Next Next post: Natural deodorant: Does it work?